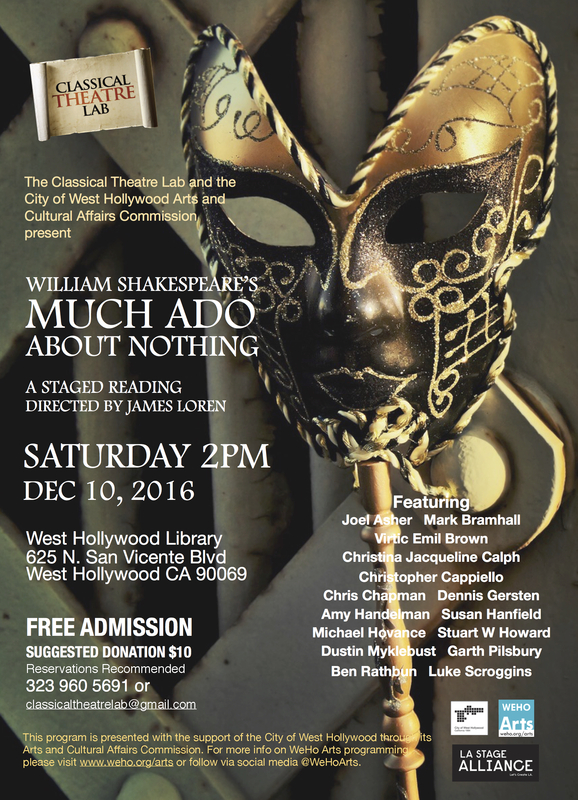 Much ado about this Saturday’s reading of…Shakespeare’s Much Ado About Nothing! Hey everyone! I couldn’t be more thrilled to be playing Beatrice alongside an absolutely sublime cast, in a fully staged reading of Shakespeare’s Much Ado About Nothing directed by James Loren. Please join us this Saturday December 10th at 2pm at the West Hollywood Library. Admission is FREE – thanks to a generous grant from the City of West Hollywood. I hope to see you there! This entry was posted in Actor, News, Press and tagged William Shakespeare; Beatrice; Much Ado About Nothing; Theatre; Classical Theatre Lab; City of West Hollywood; West Hollywood Library; Staged Reading; Classical Theatre; Susan Hanfield. Bookmark the permalink. ← LEX JULIA – A Staged Reading of a New Play – Saturday Nov 19 at 2pm!